The recently renovated hotel De Londres is one of the main 3 star hotels near the center of Riccione. It faces Viale Dante, in the central area Alba di Riccione, in a tranquil location only 50 meters from the sea. The Hotel De Londres near Viale Dante is equipped with all services that characterize the typical 3 star hotels in Riccione. In addition, the hotel has a welcoming and fresh external space with a heated pool and whirlpool for a fun and relaxing time. Our 3 star hotel has a restaurant where it is possible to sample the local gourmet delicacies, have a sweet and savory buffet breakfast, an “a la carte” menu with daily fish selections and a buffet with vegetables and side dishes. The hotel offers a free parking service until the parking spaces are not longer available at approximately 800 meters from the hotel and has a covered multi-level parking garage available for a fee at 100 meters from the facility. 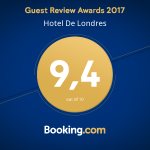 The services cited are only some of the ones offered by the staff of the hotel De Londres for their customers: all services are planned to guarantee an ideal vacation.